A mecca for tropical biologists, Barro Colorado Island and five surrounding peninsulas provide easy access to central Panama’s of lowland tropical forest. The 1,560 hectare island was formed when engineers dammed the Chagres River in 1914 to create Gatun Lake, the main channel of the Panama Canal. Enthusiastic interactions among more than 400 students and experts in their fields who visit each year lead to innovative research projects and have contributed to the more than 13,000 STRI scientific publications since Barro Colorado became a reserve in 1923. On Barro Colorado Island, we study everything from lightning strikes on towering trees to the microbes and chemical cocktails that engineer mind-boggling plant and animal diversity. Nearly 100 years of climate data, four decades of environmental monitoring and the establishment of the first long-term, large-scale tropical forest monitoring plot in 1980, provide critical tools to learn how tropical forests and their inhabitants change through time. How do fig trees punish cheaters? Do pests keep rare tree species from becoming common? Engineers dammed the Chagres River to create Gatun Lake, the main channel of the Panama Canal. 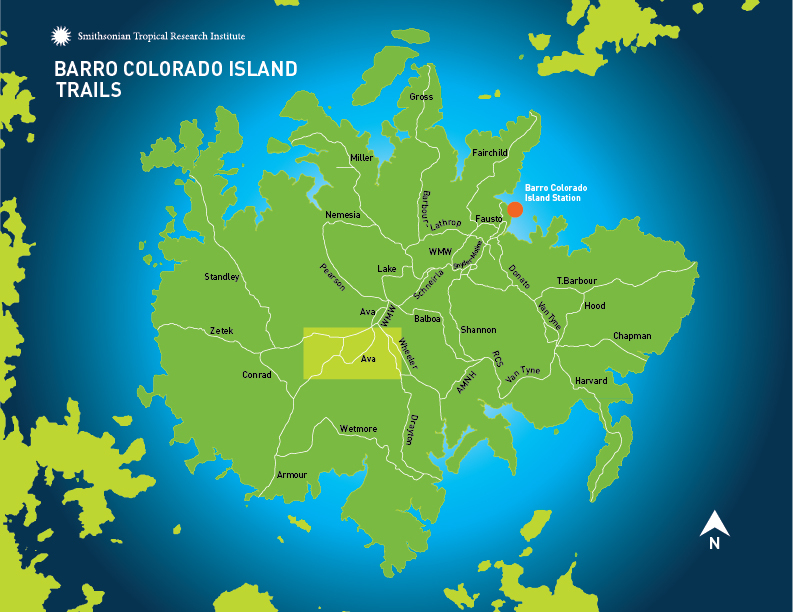 Barro Colorado Island, named for its red clay soil is the largest island in the lake, covering 15 square kilometers. As World War II began, an act of the U.S. Congress placed the management of the independent research station under a board composed of the heads of certain government executive departments and several prominent scientists. Station management was officially transferred to the Smithsonian Institution. Island Naturalist Martin Moynihan urged the Smithsonian to create the Smithsonian Tropical Research Institute, headquartered in Panama, but with the broader mission of studying tropical biology around the world. 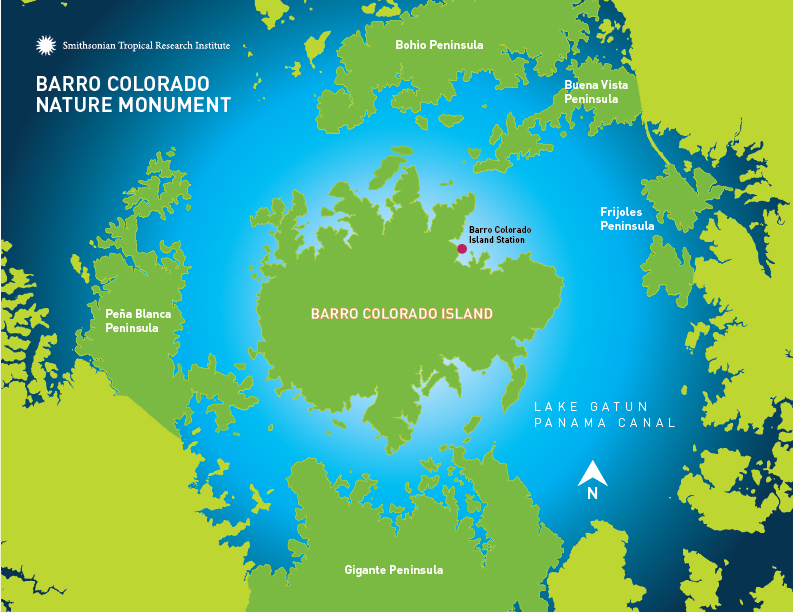 One of the first areas to revert to Panamanian territory as a result of the Carter-Torrijos Canal treaties, the Barro Colorado Nature Monument includes Barro Colorado Island as well as a buffer zone formed by Gigante, Peña Blanca, Bohío, Buena Vista and Frijoles peninsulas on the mainland. The Smithsonian continues to manage the research station. Scientists who work on Barro Colorado Island each year are supported by a scientific coordinator, park rangers who keep the monument free of poachers, a team of cooks and kitchen staff who supply three meals a day, mechanics who maintain boats for transportation and research and office and maintenance staff who keep the place running smoothly. 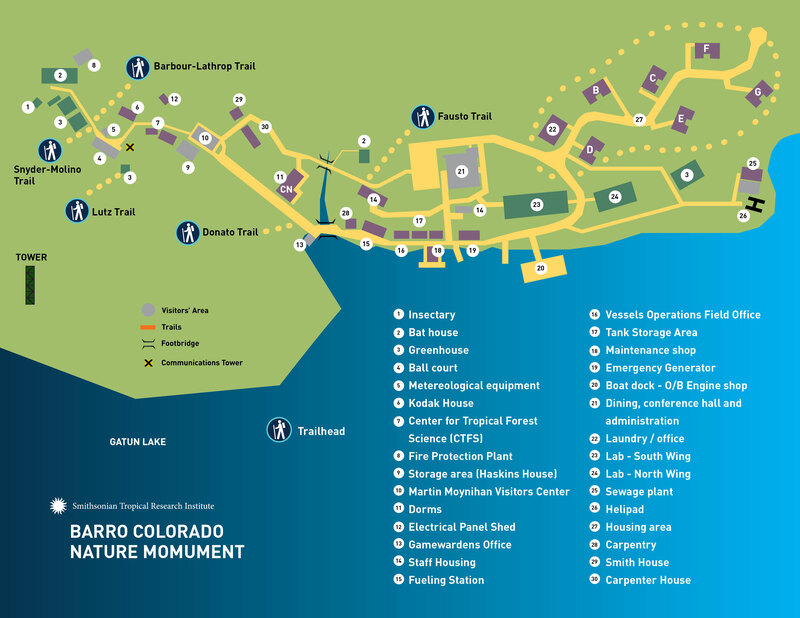 Barro Colorado has first-rate facilities on the doorstep of an isolated tropical ecosystem. Visiting researchers have comfortable dorms, air-conditioned labs and a dining hall where three hot meals are served every day. The station has laboratory resources available to ensure researchers can process, store and analyze samples. A fleet of small boats is available to move researchers from the island to the adjacent peninsulas, where manipulative field work is permitted. A wealth of long-term forest and climate data help both new arrivals and long-time visitors frame their research in an environmental and historical context that is practically unrivaled anywhere else in the tropics. The 50-hectare long-term forestmonitoring plot was established in 1980. Every five years since 1980 all free-standing woody stems at least 10 mm diameter at breast height are identified, tagged, and mapped. This first plot set the standard for the Smithsonian’s ForestGEO network, which now monitors the growth and survival of approximately 6 million trees and 10,000 species at 63 plots around the globe. The island’s formal physical monitoring program began in 1972 and builds on climate data collected since the construction of the Panama Canal in the early 1900s. The program gathers a full suite of meteorological and hydrological variables from forest floor to canopy with two 50-meter towers and a weir along the Lutz stream. Comparative data are collected by meteorological towers around Panama. Daily transportation to and from the island is on the Jacana, the Morpho and via water taxi. Prior arrangements need to be made for shipping equipment or excess luggage. Please contact the scientific coordination office to arrange for shipping large items to and from the island. Please note: departure times are punctual so plan on arriving at the dock early. BCI has a small fleet of boats to support scientific research. The boats have traditionally been available for project use to all STRI researchers. In order to request a boat, you need to have an Panama Canal Authority (ACP) small boat operator license and a signed approve form for gas dispatch. Please contact the scientific coordination office for information on how to obtain an ACP boat license, receive training and to reserve vessels for research purposes. Visitors on field courses and researchers doing manipulative fieldwork may stay on Gigante peninsula in modest accommodations. A kitchen is available. Courses may arrange for a cook. Solar panels supply limited electricity. There are no facilities on the other peninsulas but these host a number of ongoing long-term experiments. BCI has an insectarium, two bat cages, a soil lab and five greenhouses for research. Availability of these ambient labs varies. Visiting researchers are strongly encouraged to make arrangements ahead of time. Barro Colorado's laboratories are fully equipped with the latest technology field scientists need to collect, process, study and store samples. The island can house up to 65 visitors in double-occupancy dorms. A handful of family units are also available for long-term visitors. All rooms include bathrooms, desks, lamps, beds, fans, linens and towels. Many have balconies or patios. The family units have kitchenettes, dining and living areas. Hot meals are served in the dining hall at 6:30am, noon and 6:00 pm. Vegetarian dishes can be prepared if requested in advance. If you plan to be in the field all day, you can ask the kitchen crew to save meals. Breakfast cereal, milk and sandwich materials are always available. Non-residents need to reserve meals in advance. As part of a $37.5-million U.S. government initiative to improve earthquake monitoring following the devastating tsunami in the Indian Ocean in 2004, a seismic sensor was installed on Barro Colorado Island in 2006. The sensor is one of more than 150 sensors in the U.S. Geological Survey’s Global Seismographic Network. Barro Colorado Island is located 30km from Panama City. Access to the station is limited to prearranged travel on STRI boats leaving several times a day from Gamboa on the mainland. Boat reservations must be made in advance. 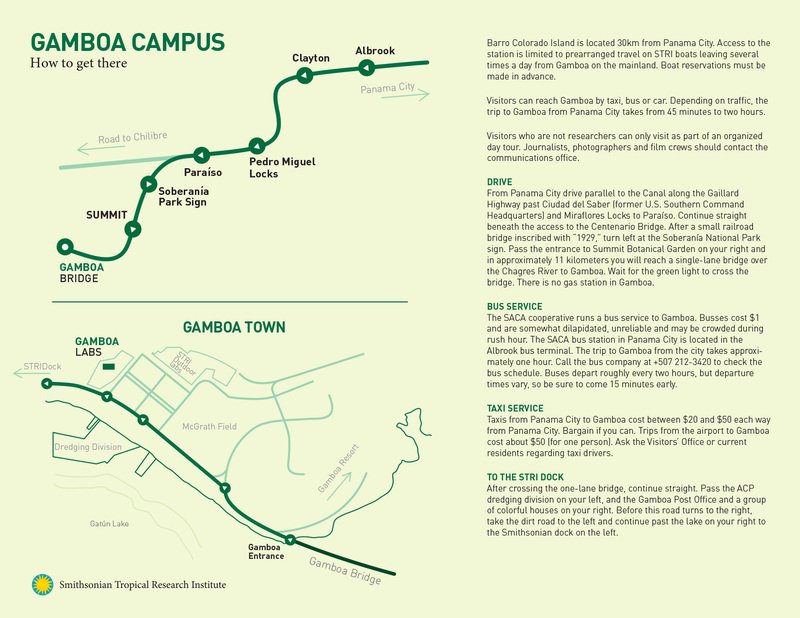 Visitors can reach Gamboa by taxi, bus or car. Depending on traffic, the trip to Gamboa from Panama City takes from 45 minutes to two hours. Visitors who are not researchers can only visit as part of an organized day tour. Journalists, photographers and film crews please contact the Communication Office.